"Long Xuyen is the first Vietnamese town in which I ever spent any time. Although positioned on a main route between Ho Ch� Minh City and Cambodia, the city receives few foreign visitors. Most travellers prefer to stopover in Chau Doc or Can Thơ. This means it�s very much the real deal. There are no tourist oriented markets so haggling�s not a big thing (that�s what price tags are for), and touts luring travellers into bars, hotels - or whatever - are virtually non existent. I�ve returned several times and seen the modern world gradually arrive into town. Once, there were no western style fast food joints but nowadays those in need of a junk food fix can drop into Jollibee, a Filipino burger chain, Lotteria, a Japanese oufit, or even grab a seasoned wing or two at the Colonel�s newly arrived outlet. But why would you?" 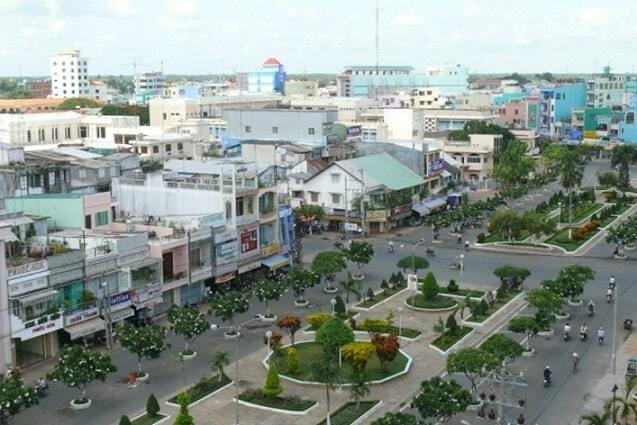 Long Xuyen - is the capital of An Giang province. It is the second largest city in the Mekong Delta, while it's also the centre for politics, economy and culture. There are many, lively markets in the city, which are very interesting for visitors. In the evening the lit streets invite you for a long walk. From the spacious promenade you have a nice view of the colourful, numerous floating villages on the river, where they cultivate all kind of fish. 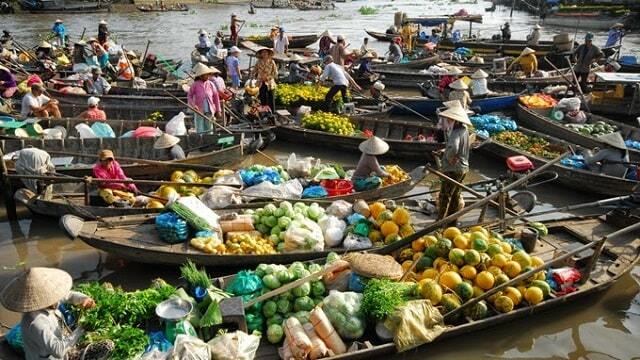 There is also a large, very interesting floating market and an impressive market hall in Long Xuyen. Long Xuyen you will also find the largest Catholic church in the Mekong Delta, which was completed during the war (1965-1973) with the Americans. Other attractions include the Chinese community hall My Phuoc, An Giang, the new museum, the Cao Dai temple and a crocodile farm. There are several other interesting places to visit in the area of Long Xuyen, such as craft villages for the production of noodles, rice mats and mushrooms. Cao Dai is the largest sect of Vietnam. About 2 million Vietnamese are followers of the Caodaism. 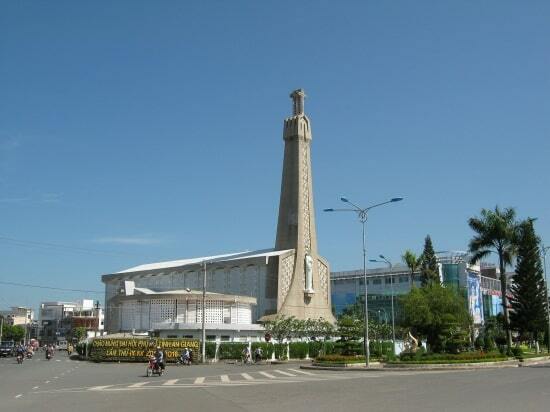 There's also a large number of Cao Dai followers in Long Xuyen. Especially in the south of the country. The founder of the sect Ngo Van Chieu was an official from Phu Quoc. Between 1919 and 1925 he saw a supreme being in some trances. That supreme would have been manifested in different guises to the people in the past. Jesus, Mohammed and Confucius are just some of those shapes. But the supreme appeared to him being in his unit to Ngo Van Chieu. Claiming that all religions are actually a manifestation of the same meta-religion: the Cao Dai. Until 1939 Long Xuyen was the headquarters of the 1939 founded Hoa Hao sect, who had his own army. Supporters were mostly farmers, tenants and agricultural workers. The sect grew rapidly under the Japanese occupation in World War II. After the assassination of its founder in 1947 the sect was soon dissolved. Today they assert that the sect had around two million followers. On the other side of town is the Tiger Island Ho Oc, which is home to Ton Duc Thang, the successor of former President Ho Chi Minh. You can visit his birthplace and childhood home in My Hoa Hung village on Tiger Island. You take the ferry boat in My Hoa Hung. Ton Duc Thang Museum displays the shackles he wore when he was in Con Dao prison 16 years for conspiracy against the French. Near Long Xuyen you can visit the archaeological site of Oc Eo. The excavated city is located just south of the Mekong Delta and was the main port of the Funan Empire and would have existed in the 1st century to the 7th century. The main reason for the flourishing of Oc-Eo is given its sea trade routes between Peninsular Malaysia and India on one side and the Mekong and China on the other. However, most of the excavations were brought to the museum in Can Tho and Saigon. But you can also find some pieces in the local museum in Long Xuyen. The city was discovered along with many other ancient channels and towns on aerial photographs that were made by the French of southern Vietnam in the 20s of the 20th century. Many of the gems, semi-precious stones, metals and other commodities did not come from the region itself and indicate a flourishing trade in the city. Every new day hundreds of boats are gathering at dawn, in the river. It is the Floating Market, where traders on the river are trading together. The main products sold agricultural products and specialties from the town of Cai Rang, Chau Thanh District and surrounding areas. Each boat has hung a long upright pole, in which samples of the products sold. The Long Xuyen floating market takes almost the whole day. The whole day it's busy, while other floating markets are usually a few hours busy. 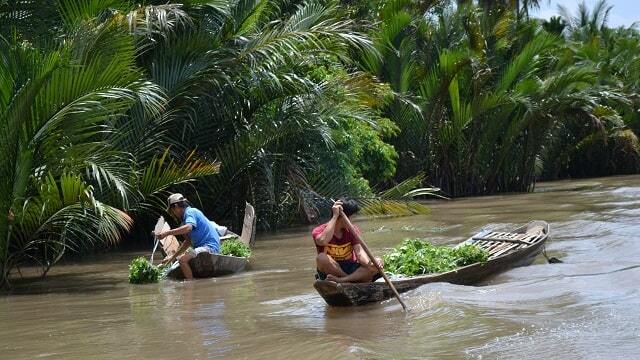 In the area of Long Xuyen are three floating markets. They start early in the morning, but around 09:00 these markets are becoming more quiet. The construction of the cathedral of Long Xuyen begun in 1958 and was suspended in 1960. Due to lack of funds and problems during the war, the construction was interrupted until 1962. The cathedral was completed and consecrated in 1973. The cathedral is one of the largest Catholic churches in the Mekong Delta and located in the center of town. The cathedral is 60 meters long, 18 meters wide and 20 meters high. The cathedral accommodates 1000 worshipers. The church, on a sort of concrete island, is the beautifully lit at night. The 50 meter high bell tower is in the form of two folded hands, which is holding a cross.